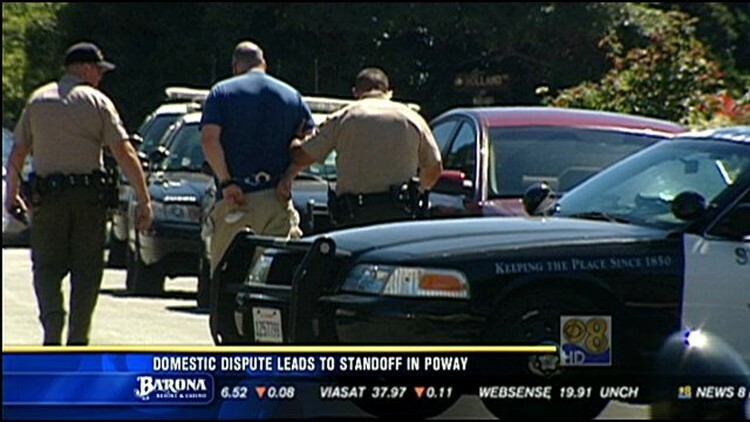 POWAY (CNS) - A North County man who got into a loud argument with his elderly mother Tuesday holed up in their home -- at times holding a crossbow -- for nearly four hours before surrendering peacefully to authorities. A neighbor concerned about the woman's safety reported the domestic dispute in the the 1400 block of Tobiasson Road in Poway about 10 a.m., sheriff's Lt. Jim Duffy said. When deputies arrived, the man -- identified as Stephen Gainder, 45 -- refused to cooperate with them, authorities said. During the initial confrontation, Gainder's actions led one deputy to shoot him with a stun gun, but the shock failed to subdue him, Duffy said. Gainder retreated into his home and refused repeated orders to surrender. At one point, he came to his front door with a crossbow in his hands, though he apparently never fired the weapon or made any threats with it, the lieutenant said. The suspect remained holed up until about 1:45 p.m., when he came outside and was taken into custody without further incident, Duffy said. No injuries were reported. The reason for the domestic dispute was unclear.